this didn't take much time cause I already had the bg donne for a while. just a few changes. Very Nice Wp,Beutiful Looking Background.And Ayanami Looks Like Allways Beutiful. Really a good job. The scan's cool and the bg fits perfectly and looks good. wooww this wallie is wonderful DarthAya!! background fits soo better with Rei and she looks soo sad.... nyaaa she is my fav character from NGE!! 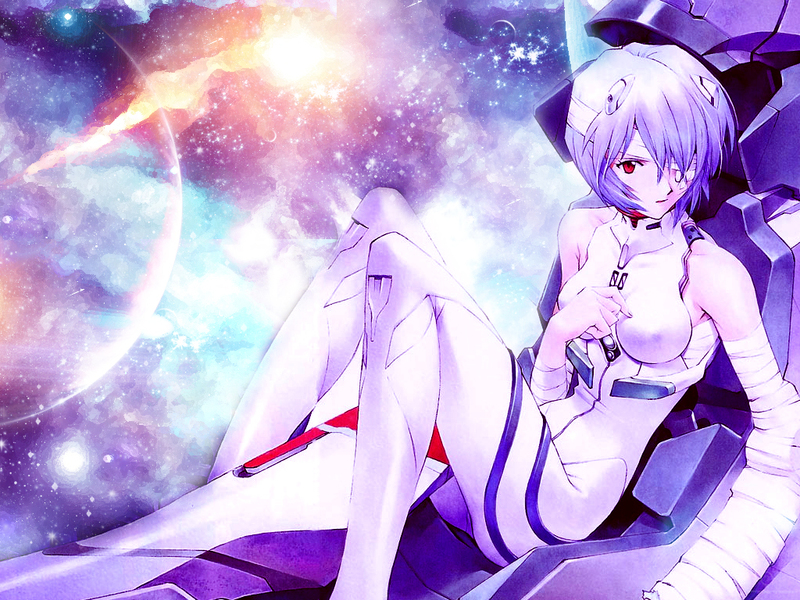 Really great, I love the concept of outer space and stars matched with Rei's persona in that particular picture. Wonderfully done. I like! I have a center fold of this in my room, but it isn't on my wall yet. Good wallpaper job! Good wall, the scan is one of my favs from Rei, and the bg looks really good, filled with effects. Godd job. Take care. A great Neon Genesis Evangelion wallie! I've been personally wanting to do something with that character. The effects and scan all look good. You can make walls so much better than me. wow ... it looks really great! its bombastic .. the colors are cool and the scan is awesome! As usual, Rei is shown very beautifully with such nice colors and spacy theme. Usually I do not like bandaged Rei, but this wall pulled it off fine. Rei looks hot as ever. Great wall; I love the colors.